Last Monday, New York Women in Communications honored high achieving women with their prestigious Matrix Award. Winners included Glenn Close, Ann Curry, Peggy Noonan, Laura Desmond and others…all stars in their own fields. I am proud to say that I received that award myself 15 years ago and still treasure it on my wall. As part of the event held in the Waldorf for 1500 executives in the communications world, a film was shown highlighting former winners–like Katie Couric and Arianna Huffington–and I was in it. 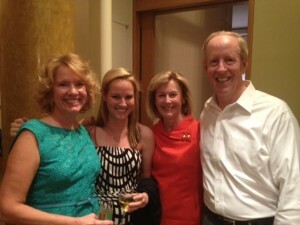 It was my chance to salute the woman I credit with anything I have ever achieved: my Mom. This video was just released and I’d like to share it with you. Enjoy! My Mom loved to read about celebrities. She inherited her fascination from her own mother who used tom pore over what she called “movie magazines.” Well, Mom must be smiling today because “The God Box” is featured as a great Mother’s Day gift in PARADE magazine which reaches over 35 million households. And The New York Post included a fantastic book review called “Unanswered Prayers” () . I’d have to say though, as far as my mother, I could not have prayed for a more loving one. So, prayers well answered! Exciting! 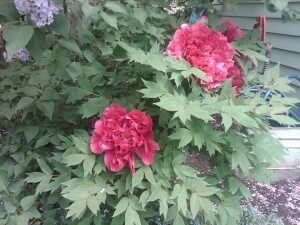 For anyone who asks if God exists, presenting the tree peony. These miraculous beauties appeared this week in my garden–like blushing dancers awaiting their ovation. Brava to spring! 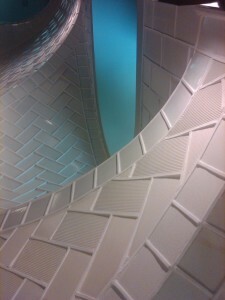 I added this picture my on @Pinterest here. Join me there. Happy earth day everyone! Good thing it’s the weekend or I’d never get caught up on all the God Box to do’s. I know Mom would say, “Give yourself a break,” but I can’t when the book is bubbling with such great news.After last Monday night’s party in New York for friends and family, and my trip to Pittsburgh for the speech at Chatham University followed by a performance of The God Box play at Adat Shalon synagogue, I headed back to New York and straight into shopping fever. The Wall St Journal was coming to my house to shoot me in my Mother’s garden and I had to look casual but ideally cute. Ever try to shop for relaxed clothes when you are half asleep? After smiling into the camera a zillion times (actually for me, the harder thing was not smiling! ), I’ve got blogs to write, tweets to tweet and more packing to do for next week’s trip to Chicago. But the best news is that the book is really moving up the ranks in amazon ( we hit the # 6 spot among all spiritual books this week) and Barnes and Noble stores have already been re-ordering. So that energizes me all over again! It amazes me how the story of something so simple appeals to so many…and has so many moving parts behind it. And so many loving hands on the God Box team to make it all happen smoothly. Monday night, we celebrate together! So, Mom, guess my feet will keep running for now…for you! Just presented at Pittsburgh’s Chatham University in the Mellon Board Room that was once the Natatorium, one of the first indoor swimming pools ever-gorgeous white tiled ceiling. And yes, robin’s egg blue shining from the sun! Growing up, my Dad always said, “Never miss a chance to celebrate” so it was fitting to throw a family and friends party to give “The God Box” a proper launch. About 45 wonderful people gathered in our apartment in New York for drinks, memories and toasts to the new little book of love. The God Box is all about her but it is also about the bonds of family, the power of believing and the lifelong lessons of love and letting go. And this book and the companion performance are also about helping to end the scourge of cancer that has taken so much from so many. On my way to Pittsburgh to start the tour of love, with a speech at Chatham College in the morning on Wednesday and later that night, a performance of the play at Adat Shalom Synagogue in Cheswick at 7PM. That is open to the public and a ticket includes both the play and my donated book, with all proceeds going to the Jewish Family and Childrens Services. Excited to share my story, my family…and especially, my Mom with the world. And you can help! Please order a book on amazon today (ow.ly/akQwN)or pop into Barnes and Noble. Let’s make The God Box a record breaker in the inspiration department! Mom knew when she saw my foot tapping wildly under the desk (just as hers did, by the way! ), that I was anxiously trying to make something happen. I am guilty of trying to press my willpower into service when I really, really want something. And here’s what I really hope for right now. I really hope that this little book will go straight to the hearts of millions of people. I hope in some way it will bring comfort and peace to those who have lost someone they love…that it will bring needed relief and smiles to a worried world…and that it might inspire others to start their own God Box ritual and legacy. I hope that its success will contribute in a big way to the war against cancer—where I am dedicating the proceeds, among other local causes. And most of all, I hope for something that I will just have to trust comes true: that Mom will be proud and know that I have tried to tell her story with the best I’ve got. All that said, the only way that all this can happen is if people buy the book. (Sharing your copy is wonderful, but everyone ought to have their own!). So, as is tradition on ‘Opening Day’ of a new book, I ask that tomorrow you invite your personal social circles to order it on amazon http://www.amazon.com/The-God-Box-Sharing-Mothers/dp/1608323609/ref=sr_1_1?s=books&ie=UTF8&qid=1334601082&sr=1-1 . Every book bought that day drives the opening rankings which is what inspires booksellers, media folks and others to pay attention and build greater reach. And if your pals like the book, please ask if they’d post a review on amazon.com, again invaluable for readers. More than anything, I want to say thank you to an amazing group of people who have been by my side, guardian angels, day by day for months bringing their own creativity and heart and skill to the launch of this labor of love: Chelsea Castner, Lissa Lowe, Rachel Cost, Jennie Willink, Susan Kittenplan, Martha Wollner, Kristin Brewer, Michael Sullivan, David Broad, Tony Chow, Phillip Ting, Dennis Clevenger, Julie Vetter, Jude Lutge, Kathryn Whyte, Mark Laita, Beth Feldman, Leslie Norden, Maggie Howley, Bryan Carroll, Lari Bishop, Sheila Parr, Alan Grimes, Jenn McMurray, Abby Kitten and Tanya Hall and likely many hands that touched this book with their talent. 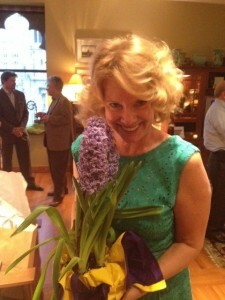 Thank you from the bottom of my heart, Hands on, Mary Lou. Last night, on a beautiful April evening in my hometown of Philadelphia, I introduced “The God Box”, surrounded by the people I love best, my family. Not only my beloved Joe, brother Jack and Sandy, sister in law Ginny and Tony, but many of our closest friends and the extended family of those who have battled through cancer. The event was the annual Coaches VS Cancer Gala which has raised over $8 million for the American Cancer Society’s research and services programs. It was held in the Park Hyatt, still affectionately known as The Bellevue by Philly people, in the ballroom where I first fell in love with Joe. 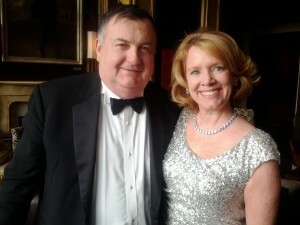 We danced that night at a Saint Joe’s event and last night after I talked about the book and the role it will play fighting this terrible disease. Though I have to admit my too – high heels took a toll on my toes, my heart couldn’t be lighter.If I look sparkley outside, that’s nothing compared to what I feel inside. The God Box is on its way. here we go, Mom! 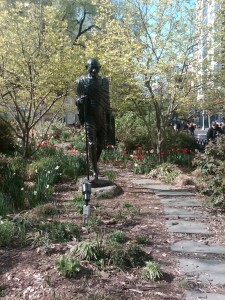 I took this photo this morning of the lovely sculpture of Ghandi striding through the Union Square garden in NYC. Peaceful, calming,hopeful in springtime. I added this to my on @Pinterest here. Join me there. First wave of press for “The God Box” – thank you! 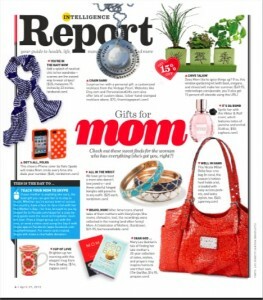 Thank you Redbook! 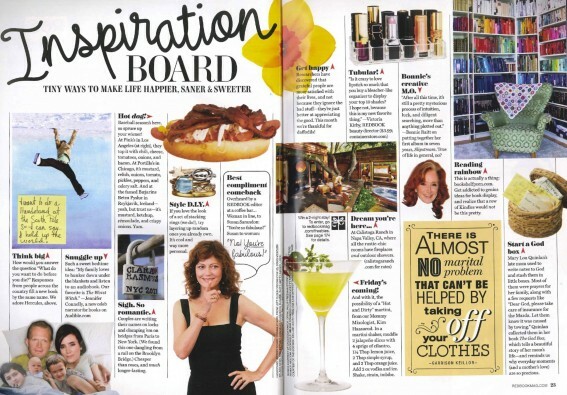 We are so thrilled that The God Box was included in the April issue’s “Inspiration Board.” This editorial mention encourages people to start their own God Box – and speaks to a mother’s love. 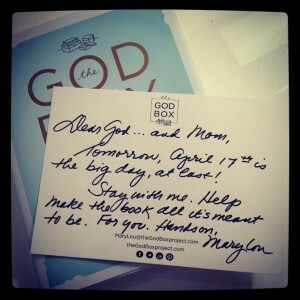 With press for the book just beginning to spring forth, it is very exciting to think of how far-reaching of an impact my Mom’s ritual of keeping a God Box could be – and how many people could find comfort in writing down thoughts and letting them go.